Developed by Microsoft, Montage is a free platform that allows you to collect, curate, and display content from the Web. If you like the way paper.li aggregates content and displays it in an attractive format, think of Montage as a tool to allow you to create your own paper.li without advertisements and with the content and layout you choose. You can sign into Montage by authenticating using a LiveID, Twitter or Facebook. To get started, you can create a montage from scratch or from a trending topic. When you input a word or phrase you’re interested in, Montage will automatically display results on a Web page with a layout that consists of a number of panels arranged in columns and rows. You can control both the panel content and the column numbers and layout. You’re given the option to change the layout and content display immediately. You can browse through suggested layouts/content displays to select one you like, but don’t focus on the content at this point because you can always change that. Focus on the look and feel of your layout. Once you select a suggested layout and content display, you can decide you’re happy with it or modify it. For example, you change the content and layout of individual panels. Hovering over an individual panel causes these options to be displayed. You can select specific news items and images by pinning them or allow the Montage to draw from random content posted on the web. You can display news items and images in a list or slideshow format. I suggest making use of the text option, since adding text is a powerful way to add context to a montage you’re creating. You have some basic text formatting options and you do have the ability to add hyperlinks. As you add content to your panels, play with column size and add additional columns if it’s helpful. 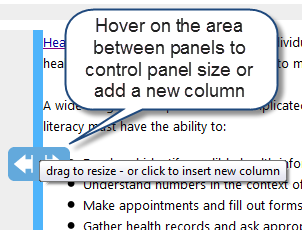 You can also drag and drop panels to change their relative positions. For a video overview of Montage creation, see this page. As an instructor, Montage is a nice tool to help you curate content for your learners from feeds or from static content that you’ve pre-selected. Your Montage should ideally tell a story and you can control the “narration” of the story by adding text and by arranging the different types of content that are in your various panels and their sequence. You can include videos you’ve found or those you’ve created (e.g., to illustrate concepts, demonstrate procedures, provide guidelines, or even launch a problem-based learning challenge). You can also use text boxes to add questions and challenges, link to polls, quizzes, and other media, to add additional interactivity. Because learners can scan your page, they can pull specific content that ‘s interesting to them. As I was exploring Montage, I learned that it’s probably better to pin images rather than to rely on feeds, which can pull up some pretty random stuff. I created news panels that will pull random content as well as those that include static content I want viewers to consider. Additionally, using a variety of different search terms related to a topic in different panels creates a more dynamic Montage. Similarly, if your search topic in twitter doesn’t garner a huge amount of tweets you might want to combine terms (for example, I searched for “health literacy OR epatients”). Asking learners to create their own montage requires them to reflect on how disparate types of web content are connected. You can also suggest that learners use text boxes to add their own reflections and/or to challenge their fellow learners. My Montage on health literacy is here.